Dimensions 0.72 by 6 by 9 in. Amazon.com description: Product Description: The thread of the book is an account of the 1970 Missouri large schools high school state football championship my St. Louis University High team won. We were unlikely champions: undersized, not very fast, no home field, high academic standards for admission, half our games against Top 10 teams in the state. We barely qualified for the four-team state playoff, we faced the heavily favored title game opponent having won our previous four games by an average of just 4.5 points, including a 14-13 victory over our archrival in front of 18,000 people at Busch Stadium. 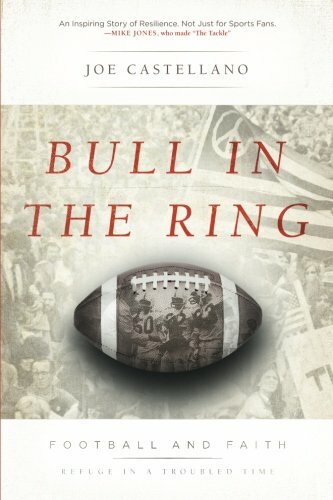 I was a center and linebacker, and one of the team captains.The story of the book, though, is how football and that championship season became a refuge for my classmates and me, young Baby Boomers whose great but naÃ¯ve ambition was tempered by the frightening, threatening social turmoil of the late 1960s. The Vietnam War was escalating, the Civil Rights Movement was exploding, college campuses were erupting in protest, and many of us were at war with our parents' generation. Adding to our drama, we suffered a very personal tragedy that shook us, just as the season and the school year began.Â I tell this true story from the first person, and through the reminiscences of a handful of the key characters who were central to it, including our legendary head coach Paul Martel, who died in January 2016 at age 91. I conclude the book with reflections of what that season and accomplishment meant to us, particularly as we now face the final quarter of our lives. Educated by Jesuit priests, who challenged us to question, to commit to something, and to act, we pulled together in common purpose, at least for that season. Most of us were buoyed by our belief in each other, and by our faith in God. And, at least for me, I experienced life lessons that proved invaluable for what I was to become: a daily newspaper sportswriter and columnist, then a business executive, husband and father.true sports stories such as Remember the Titans, Hoosiers, Friday Night Lights, and One Shot at Forever (the story of the small-school Macon, Illinois baseball team that finished second in the 1971 Illinois baseball tournament), offer drama beyond the tension of high school competition on the fields and courts. This story provides plenty for an avid sports fan. But it, too, offers much more. I suspect Baby Boomers around the country, and readers of all ages, can relate to the way dreams evolve, become compromised or rationalized, and come to rest. And how hard-earned accomplishments, especially those boosted by the kind hand of an unseen power, provide meaning and comfort as we reflect on the impact we have made on the world. Among the characters: our best player, an earnest and unselfish athlete who had his best game in the state championship; our only African-American teammate, whose parents moved him to St. Louis to distance him from the racial turmoil in central Alabama in the mid-1960s; our biggest player, a character seemingly straight from Clair Bee's Chip Hilton stories; our quarterback, a free-spirited genius who exasperated the coaches but pulled off heroic plays; an under-sized defensive end seemingly possessed by the spirit of his cherished older brother killed in Vietnam; and our Student Council secretary, an African-American who challenged us to confront society's racial issues and later revealed he is gay.